Back in our Session special issue a few months back we first introduced you to a drummer at the forefront of the online session playing phenomenon - Tim Kitchen. Now, Tim starts the first of a new series letting you into his world so you can see for yourself just what online session drumming is, and how Tim is making both a career and a name for himself from it. 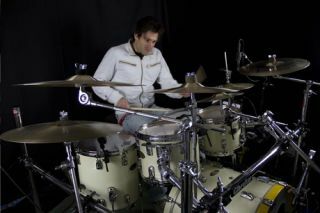 My name is Tim Kitchen and I'm one of a few professional what I call 'Online Session Drummers' in the UK. This basically means that I have a small home studio set up and I record drums for bands, artists and musicians from around the world. What makes me different from regular session players is that I seldom venture out of my home studio to visit other studios. I very rarely ever meet my clients face to face and we never jam or work through tracks together - in fact, most of the time we never even speak on the phone! Time differences and my schedule make it pretty impractical to do phone chats, so the vast majority of our communication is done via email. This might all sound very impersonal, but it's easy to get used to and the majority of clients absolutely love working this way as it means that they don't have to take a bunch of time off what they're doing and book an expensive studio for a few days. There's a new breed of us Online Session Drummers (OSDs) emerging around the world. Like me, most OSDs are players that you might not have heard about in the magazines or seen on DVDs, but we're out there every day recording tracks for people. I guess it's a bit of an underground movement really as it doesn't get a lot of attention in the media, although since I started doing this four years ago, the scene has just exploded and I think more people are becoming aware. It's partially down to studios closing, partially down to the price of equipment dropping while the quality improves faster than ever, and partially down to folks like me spreading the word and getting drummers online. How is Online Session Drumming different from regular session drumming? Unlike regular session drummers who often rely on their contacts to get gigs, most of the online session work is fought over on Google, Facebook and musicians classifieds websites. Although the scene is growing, there is still a large proportion of our target market that doesn't know we exist, so OSDs spread the word on forums around the world trying to get in front of as many bands 'looking for a drummer' as possible. Typical reaction from one of my clients is "Wow! I had no idea people like you existed, that's exactly what I need!" You probably know that nearly all 'regular' session players have their own studios that they record from, and it's how the vast majority of sessions have been done since the mid '00s. The great thing about taking everything online is that us OSDs can now compete against the 'big guys' to get the sessions. In fact, when someone searches online for some drum tracks, the folks who win are rarely the players you will have heard of. They are drummers who have learnt about Google advertising, building websites and making YouTube videos to promote their playing rather than guys who have played big gigs with established artists. Location now no longer matters, and from my studio in rural Devon I'm competing against drummers in LA and London - but of course my studio rent is a fraction of their's. The actual process behind OSD-ing is geared around making it as easy as possible to record tracks quickly, allowing us to get more songs done per day/week. Normally a client will get in touch through my website, through YouTube or an ad I've placed somewhere like Gumtree or Craigslist, or I'll get in touch with them if they've placed an ad on Starnow (or somewhere like that) about needing a drummer. They've often seen my videos on my site, so if they're getting in contact I know we're good to go. I'll then go away and record them a free, no-obligation demo. The reason for this is just so that they can hear exactly what the finished product will sound like, and I can get their feelings on the direction, early on, to save me going off on a tangent! We'll discuss any changes that need to be made and I'll go and record them, if necessary. This process varies slightly depending on how many tracks they are getting done- for example if I'm doing an album, I might do a few tracks to start off with so I can learn their tastes and preferences. Once I've nailed these, we'll go through the rest all in one go as it saves me time as opposed to doing them one at a time. Once everyone's happy with the drums, the client pays me and I bounce (export) the files and send them over using Dropbox. Some clients like the individual mic channels, whereas some prefer a full kit stereo mix. So who do we record for? I've done the vast majority of my recording work for ordinary bands and musicians like you and I - the sort of band you might see at your local venue on any given night. They are bands that can't find the right drummer and need to record an album, EP or demo. Another group of clients is the producer who has different artists and needs quality tracks for them to sing over. They'll sometimes get a whole band of online session players to do their songs. Songwriters or songwriting teams are another popular client. Maybe they have jobs as well so they don't have time to do the whole studio thing and have recorded some demos at home and want to give them a bit of life, which is when they get in contact with me. The beauty of everyone recording at home is that the number of potential clients we have out there is just growing exponentially. If someone sees a video they like on YouTube, they can think 'I'll have a bit of that', message me, and within a few days their song sounds like what they saw! I'm going to be keeping you up-to-date with what I get up to in my OSD world each month. So until next month, if you want to find out more about me, my website is www.TimLovesDrums.com, and I have a book about OSD-ing called 'Paid to Play Drums: The World of Online Session Drumming and How to Get Started' which you can grab from Amazon.